For a long time, you searched for a backup plugin? Well, you found one covering all your needs. You installed BackWPup. But now you wonder how to really use your backup plugin? You would love to have a whole list about comprehensive BackWPup tutorials? In Inpsyde’s blog (the WordPress VIP agency behind BackWPup) has been published a post recently. 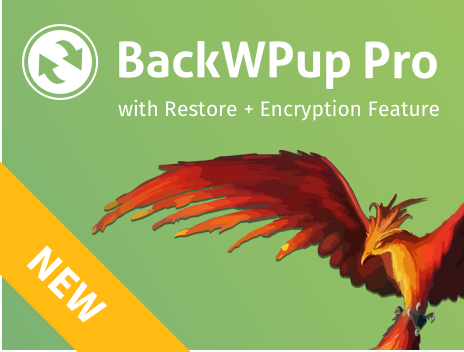 There, Inpsyde listed many useful BackWPup Tutorials. Moreover, you find a short introduction to each tutorial with its individual focus. Maybe BackWPup already saved your website? Or you want to give something back? Then support your WordPress backup plugin by becoming a beta tester! Develop mistakes and prevent new versions having bugs. Also you will be able to try out the newest features. Simply subscribe here. In the future, you will get messages as soon as a new BackWPup version is available and needs to be tested. Of course, you can always unsubscribe our newsletter. Another hint: You probably know that Inpsyde offers, besides BackWPup, many other plugins. But did you already take a look at them? Here, you can find a lucid summary. Moreover, you find the indiviual download numbers and a link to WordPress.org. So, if you would like to use the plugin, you can directly download it.